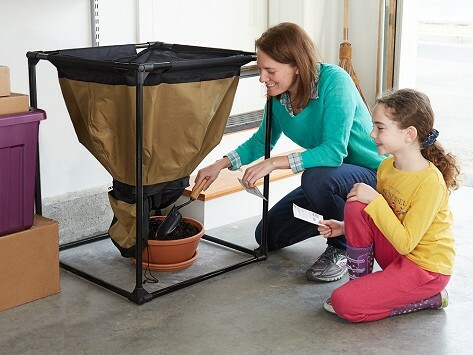 Try composting indoors with a worm composting bin. Worms do all the work here and the conical, open-frame design of the bin promotes breathability, which keeps them happy. It’s made with water-resistant fabric that has reinforced stitching for extra durability and it sits in a lightweight frame. There’s no separating or sifting needed, just unzip the bottom of the bag to access fresh compost. Made for a Lifetime. Dimensions: 26.75'' x 26.75" x 30"
Unlike other worm composting bins, Steve’s conical, open-frame design allows for more breathability, which is better for the worms. They start at the bottom of the bag and work their way up to the top, eating food waste and creating compost that's easy to access. No sifting or separating, just rich, natural goodness for your garden.